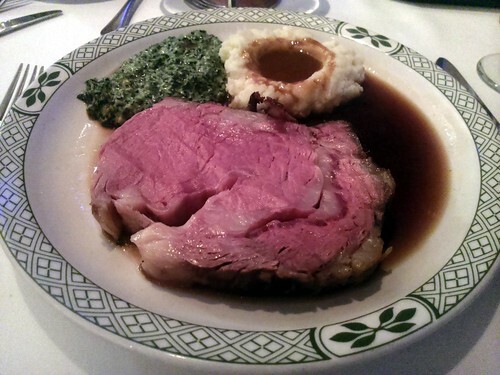 The Traveling Hungryboy: Has Lawry's Singapore Raised Its Prices? Has Lawry's Singapore Raised Its Prices? Man, is it just my imagination, or has Lawry's Singapore totally raised its prices? My jaw just dropped when I saw the menu here, as the basic Lawry's cut went for a whopping S$93 (US$74). I just checked the US website and they only charge SS$55 (US$44) for the same cut back in Beverly Hills. Pptttttttthhhh!!!! Well, at least it tasted good...so much that I even ate the fat, and now I feel kinda sick. I don't know if the high price is a result of the high rent at their new Mandarin Gallery location (333A Orchard Road, 6836-3333), but their old location diagonally across the street at Paragon couldn't have been that much cheaper.